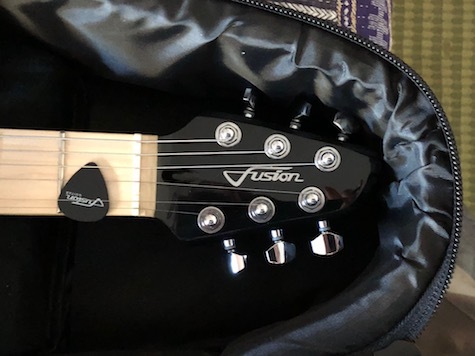 Fusion Guitar is a solid body black electric guitar with a modest built-in amplifier and its power storage battery, plus two pickups and two volume controls. An iPhone Lightning dock on the upper area of the body accommodates standard size iPhones from 5S through 8 with dedicated inserts provided. We will discuss how this dock works with your iPhone and music apps in a future article. For now, let’s examine and listen to the guitar and its accessories. Fusion Guitar is excellent, exactly as promised by this new and innovative company. The cardboard shipping carton appeared to be too small to contain a full-size guitar, but it does indeed. A custom black fabric case is included that is well-padded and has both a sturdy grab handle and nicely balanced backpack straps. 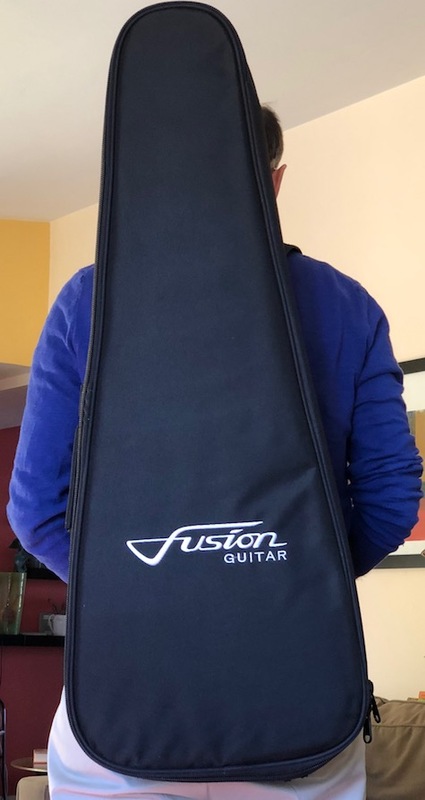 The Fusion Guitar is heavy with its internal amplifier and battery, and this backpack case is designed to be carried. It stands straight up vertically thanks to feet that support the case when it’s loaded. Inside the case, in addition to the beautiful guitar, are: a quick start guide with links to additional information; the iPhone dock inserts; an extra set of guitar strings; five black guitar picks; a microfibre cleaning cloth; a rugged black leather strap; a charging cable and plug; and some tools to assist with physical adjustments. The entire package screams quality and attention to detail and we tried to think of everything. Purchasers are advised before proceeding to charge fully the internal battery, which takes roughly four hours. 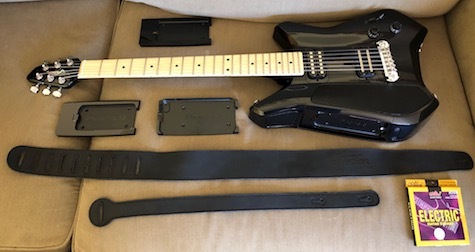 Once the Fusion Guitar is charged and the two-segment strap is assembled and adjusted and the strings are tuned, it’s easy to power up the internal amplifier and experiment with the three pickup positions and corresponding volume controls. Within a few minutes you’ll be jamming, shredding, picking, strumming, learning, teaching, busking, and enjoying your self-contained music making miracle. Note: Use this Getting Started link for help assembling your strap and much more from the company’s helpful videos. With regard to the strings – you must have received one of the very early guitars from the first production run. These early guitars were not fitted with the correct strings that Fusion Guitars had specified. The error was quickly identified and production from that point on had D’Addario strings fitted. The D’Addario strings on current production are still quite light (.009 to .042) — these were chosen deliberately as they are easier for novice players. 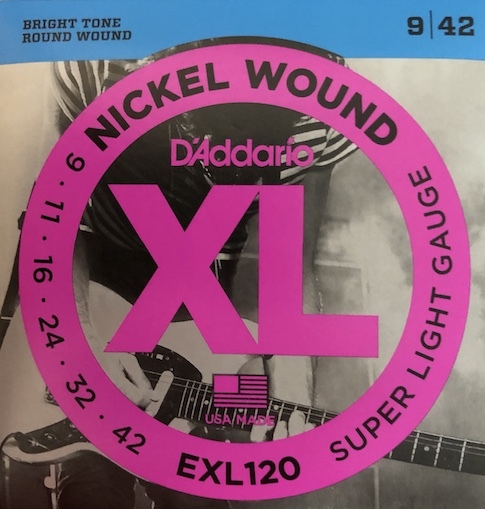 Everyone has their own preference for strings and most people may quickly change to their favourite brand and gauge but we thought D’Addario .009 to .042 was a good compromise. UPDATE — December 29, 2017. I received two sets of the D’Addario strings. They are much better than the Alice brand original strings provided. They play well, bend nicely, and respond beautifully to fretboard vibrato. Be aware that because of the light gauge you will need to retune them frequently at first with minor adjustments. Following the helpful web video instructions for replacing the strings was a bit problematic. I had to turn each bridge screw one half turn to raise it so the string ends could be released from the recessed area just to the front of the bridge. The company rep tells MyMac: Yes, that problem existed on the early models. I believe they opened up the space behind the bridge slightly on newer models. Two woods are available for the guitar fretboard. Our evaluation Fusion Guitar has a clear, white maple wood fingerboard, and it’s both gorgeous and easy to watch your finger positions when playing chords and melodies. A dark rosewood fingerboard is also available. My Taylor folk guitar has a rosewood fretboard, and I don’t have a recommendation of one over the other for playing; it’s all about appearance, and the light color maple looks splendid with the all black guitar body. 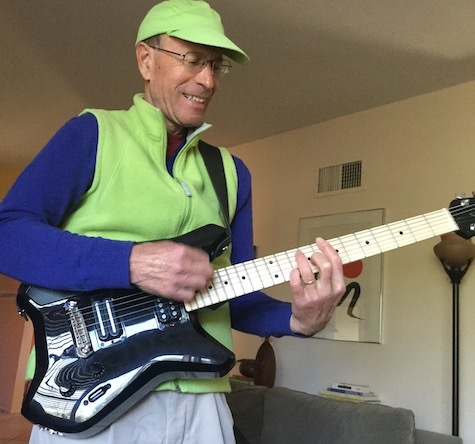 The neck is just-right narrow, as expected on an electric guitar, with a slight rounding that is also just-right for my hand size and style of chord jamming. A lot of thought and care went into the unified design of Fusion Guitar, and this modestly-rounded neck will please most purchasers. Black plastic laminate covers the neck, so its material and construction are unknown and irrelevant, given its integrity. Fusion Guitar’s built-in amplifier’s sound will fill a room at top volume, but it won’t annoy most neighbors, roommates, spouses, children, or other people nearby. There isn’t much subtlety to the pickups’ performance using the onboard speaker, but the audio output is pleasant to the ears. Sonic variety is part of the iPhone dock’s app adjustments, to be discussed in a future article. The bridge is set into an agreeable position for most intermediate guitarists. This bridge is infinitely adjustable to customize string saddle positions for expert musicians. The silver tuning pegs are medium-quality and they won’t win any awards or groans from guitar geeks. The neck cutaway is superb for playing high up the fingerboard with accuracy and presence. The plastic guitar body feels great to the touch. You are right this is incorrect and we will remove this statement from the website. I plugged my ten foot amp cable into Fusion and my practice amp and the sound was very good, as expected. Within a couple of minutes I wished I had a much longer (or nonexistent) cable, because I had become spoiled by not needing any cable to practice with Fusion’s own 20 watt amp and speaker. A thousand dollars is a lot of money, and Fusion is a lot of guitar with a lot of physical heft. This instrument is best for non-beginners as a second guitar or a travel guitar or a practice guitar. 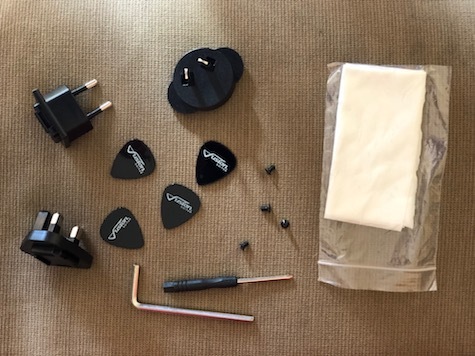 Intermediate and advanced guitarists will appreciate it more than will newbies or children, unless they are strong of body or prefer to play sitting down. This is a new product from a new company that has been developing it for a long time. I hope Fusion Guitar is a success, and that this is the first of many additional and improved models of self-amplified guitars. 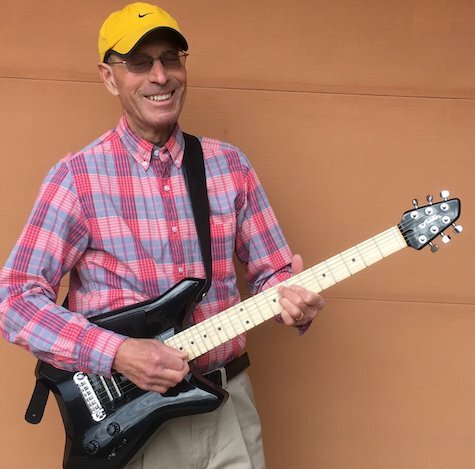 I have been playing and teaching guitar since 1962, and in those 55 years I’ve never enjoyed myself as much as I have in the time I’ve been playing and testing Fusion Guitar. Stay tuned for iPhone X compatibility. 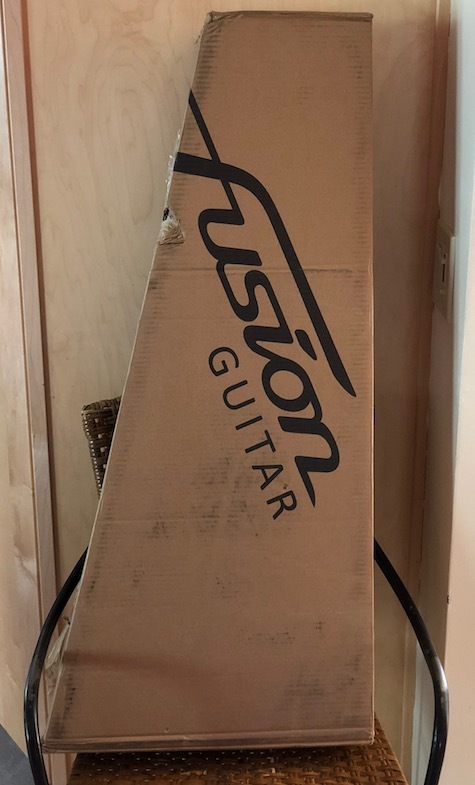 Fusion Guitar ships with a 30-day return policy available. There are not yet many online reviews for Fusion Guitar. These links may be useful. MyMac Review Rating is 9 out of 10 for Fusion Guitar as an instrument, based on its innovation, versatility, and pure joy to play.